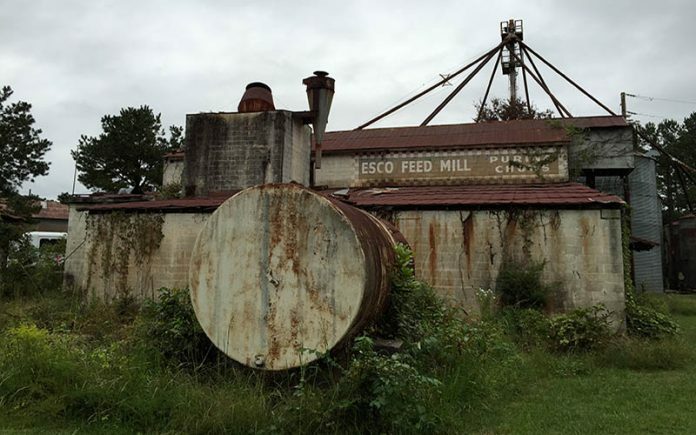 Though not featured in any Walking Dead episodes, this mill can be seen in season 4’s opening credits. Downtown Senoia, or as Walking Dead fans may know it, Woodbury. Even if you’re not a fan, you can’t refute that The Walking Dead has become synonymous with Georgia. It’s undeniable—from the ubiquitous apocalyptic Atlanta skyline to Senoia’s permanent association as the sickly-sweet town of Woodbury, the landscape has forever become associated with the undead. With all that pop culture fueling fans more rabid than a horde of walkers, Atlanta Movie Tours has capitalized on the filming locales in metro Atlanta and the surrounding countryside by offering two zombie filming tours. Recently for Best of Atlanta, we named their Big Zombie Tour Part 2 for as Atlanta’s Best Walking Dead Thrills. While the Part 1 tour focuses on filming in Atlanta, Part 2 took us down to Senoia, exploring the more rural and run-down locales. Immediately upon arrival, you learn just how much Senoia has been transformed by the show. Off of the main strip, a massive walled neighborhood—constructed for later this season—sits behind security patrols, grip trucks, and movie trailers. 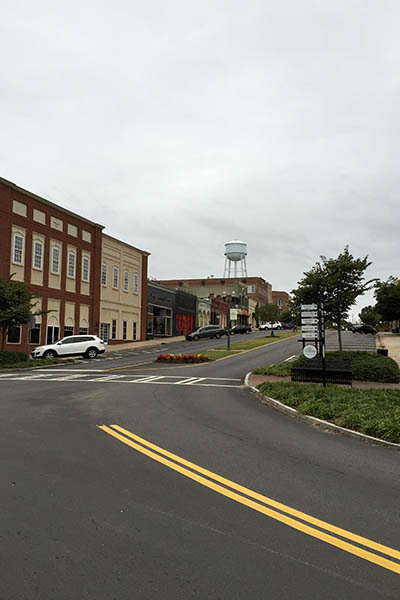 We walked uphill, inadvertently seeing downtown Senoia from the angle oft-seen in Woodbury’s wide establishing shots. Our tour met in The Woodbury Shoppe, the local purveyor of all things Walking Dead. After checking in, we were told to be sure not to miss the surprise in the store’s basement: a collection of props from the show. There, we had photo ops with “Don’t Open Dead Inside” doors, Darryl’s motorcycle, one of the prison’s jail cells, and several other TWD artifacts. 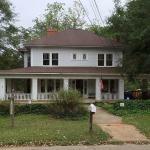 We do not recommend sitting on top of this house and eating 112 ounces of pudding. This burnt out church sits on set just outside of Senoia. 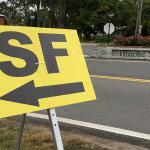 SF (short for Stalwart Films) production signs can be seen all over Senoia and near Peachtree City pointing cast and crew to current Walking Dead filming locations. Morgan’s “Clear” apartment has been painstakingly recreated down to the last detail by the town of Grantville. 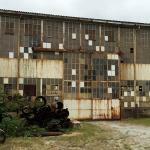 This abandoned building served as a backdrop to Woodbury’s gladiator arena. We met with the rest of our group and boarded a small bus for our three-hour tour. Our guide, Michael Jaegers, introduced himself and dropped a bombshell on the group: He is an actor who has appeared numerous times on the show as a prominent walker. After a short montage showcasing his appearances, we were entertained by behind-the-scenes stories about what it takes to become a walker, the make-up process, and the film industry in Georgia as a whole. Leaving Senoia, we headed toward Sharpsburg, home of the bar where in season two, Rick first killed the living and the pharmacy where Glenn first—never mind. Along the way, we passed the house where Rick initially encountered Joe and his marauders and, of course, the pudding house. It’s amazing how far away some of these places are from each other. Most of our time was spent in transit, but never with a dull moment. Jaegers continued to share stories and went into a wonderfully detailed explanation of the show’s walker classification: “hero” zombies in the front with full make-up and effects, airbrushed “mid-ground” walkers, and latex mask-wearing “background” walkers filling in the herd. Woodbury’s gladiator arena in all its glory. Bullet casing occasionally can be found in the dirt. 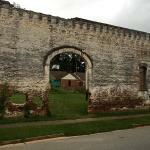 We passed several sites where the groups walked the railroads toward Terminus and arrived at our first of three excursions in Newnan. The bus parked in a seemingly abandoned warehouse, and a gate was unlocked. We walked down a narrow, overgrown path and ended up in the middle of Woodbury’s gladiator arena from season three. We were told that shell casings from the filming occasionally turn up and that we had 15 minutes at the site. After a few pictures, everyone was shuffling around, looking down, trying to take home a free piece of memorabilia hidden in the rubble. We doubled back to Senoia and were treated to the motel from season three’s “This Sorrowful Life” where Merle hotwired a car, accidentally triggered an alarm, and drew hungry walkers to a tied-up Michonne. 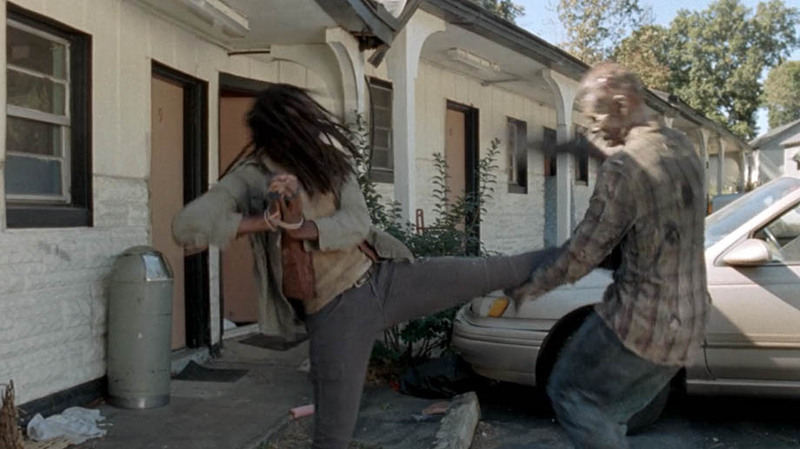 In the scene, she kicks one of those walkers in the stomach—our tour guide. Not only did we get a breakdown of just how that kick was accomplished, but also all the information we could ever want on the boot-through-the-head ending of our tour guide’s walker. Our last two stops took us to Grantville, home of Morgan’s “Clear” apartment and Haralson, where the Governor’s negotiating barn stands. The “Clear” apartment is a wonderful attraction. After production wrapped, the interior was painstakingly recreated from photographs. The detail is incredible. Arriving at the building’s doorstep, you see Morgan’s welcome mat trap. We stepped over it, immersing ourselves into the world and walked up the warning-lined stairs to the axe curtain. It’s been changed to say: “Not kidding you,” an understandable departure from the show’s more explicit wording. 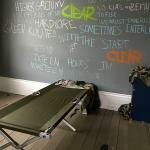 Inside, every wall has been painted in chalkboard paint and artistically filled with ramblings of a mad man. Replicas of Morgan’s cot, his traps, and ammo bring the realism up a notch. Although it’s not as cluttered as on the show, its easy to suspend one’s disbelief. Combined with the overcast day of our tour, it wouldn’t be too farfetched to think the world really did end somewhere between Senoia and Grantville. 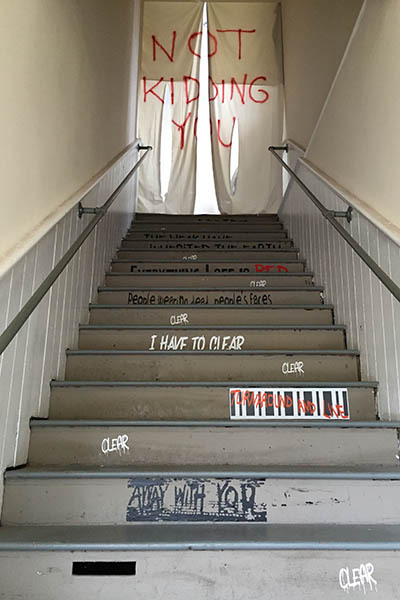 The stairs leading up to Morgan’s “Clear” apartment quickly bring you into the world of the show. 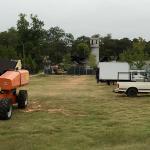 Haralson brought us the barn and site of Merle’s death among the silos. No amount of watching the show will ever do that barn justice. The musk that surrounds you as soon as the doors are opened transports you to a bygone era of economic depressions. The building has become the architectural personification of The Governor himself. It is protruding, twisted, and yet strangely pleasant on the surface. I can only imagine how much that haunted space loaned to the production of those tense scenes. Merle’s resting place is equally powerful—a strange barren spot in the grass has failed to grow back. A short drive and a few more stories later, we were back in Senoia with new memories and drained iPhone batteries. The major take away from Jaegers was that everyone, from the PAs and interns all the way up to the cast and producers, really loves working on this show. There’s a southern hospitality at play that brings all of the players together, and it has helped bring this show not only into the hearts of the fans, but also into the hearts of the community. This interaction gave us Jaegers, who led our group as a fan, not just an insider. Between his passion, the stories he told about the cast and crew, and the way many of these small towns outside Atlanta have embraced their place in the pop zeitgeist, I can only assume Atlanta Movie Tours’ Big Zombie Tour Part 2 will get even better, fulfilling its role as a friendly link between the show and its fans.